We recently visited a customer who hadn’t had an engineer service their boiler in over 3 years. The fault led to the boiler being deemed unsafe, and as a result we had to shut it down! We discovered this when called out to service the appliance that hadn’t been worked on for over three years! 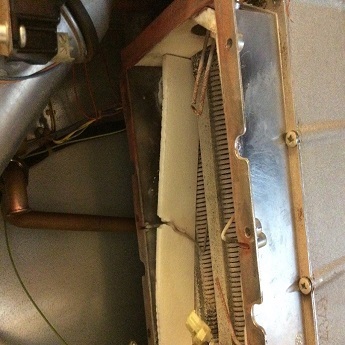 This ideal ICOS has the common fault where the heat pad retainer had failed and then moves away from the correct position. This causes products of combustion to leak outwards and distort the heat exchanger. This boiler was shut off as it was unsafe to be used. Annual servicing of your boiler ensures that it is running safely. As part of a regular maintenance check this fault, if discovered early enough, could have been rectified and the boiler saved from the skip. Carshalton Boilers are a family run business with over 50 years’ experience in the plumbing and heating industry. Our expert engineers cover South London, Surrey and surrounding areas. Contact us today or call on 020 8395 8060 for any advice or to book your boiler in for a service.